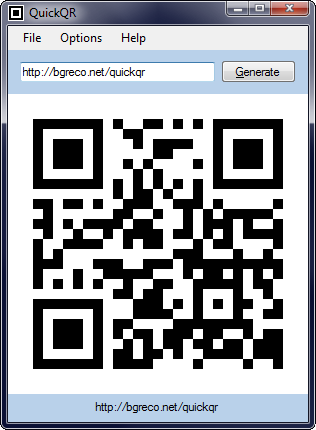 A simple tool to generate QR codes on Windows. Windows XP or newer. On XP, .NET 2.0 or higher is required. Download QuickQR.zip and extract to a location of your choice. QR code generation in this program is handled by the ZXing.Net library. This program is released under the MIT License. Source code is available at http://hg.bgreco.net/quickqr/.